We do what you, the guest, want us to do!! 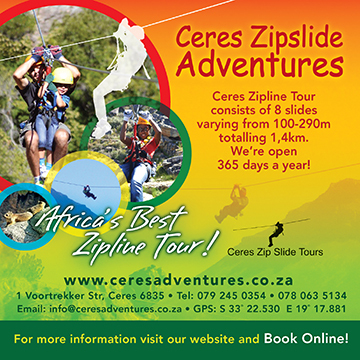 This "foefieslide" adventure is situated in the lovely mountains surrounding the Ceres Valley. A mere 1.5 hours' drive from Cape Town, it is the perfect breakaway from the hectic city life! Beautiful scenic out rides on our 271h working fruit farm, well schooled horses, personal attention, small groups. Book one or two days in advance. Waverley Hills estate is situated on the R46 between Tulbagh and Ceres at the foothills of the winter snow-capped Witzenberg mountain range. Make time to appreciate the beauty of our valley by seeing it at a slower pace while visiting award winning wine farms. We even provide wine carriers! 17 cycles available. A visit to the old "Hart en Haard" shop at Readers Restaurant is a "must" for anyone who loves cats or is privileged to share their lives with one or more cats. Photograph the beautiful landscapes and farm activities of the Tulbagh Valley. Take a tractor ride uo the historical Oudekloof Pass and enjoy breathtaking views of the Tulbagh valley and the Swartland.